It’s been a while since the trainwreck of a “study” commissioned by Brocade and performed by The Evaluator Group, but it’s still being discussed in various storage circles (and that’s not good news for Brocade). Some pretty much parroted the results, seemingly without reading the actual test. Then got all pissy when confronted about it. I did a piece on my interpretations of the results, as did Dave Alexander of WWT and J Metz of Cisco. Our mutual conclusion can be best summed up with a single animated GIF. Their hilariously bad conclusion to the higher variance in response times and higher CPU usage was that it was the cause of the software initiators. Except, they didn’t use software initiators. The had actually configured hardware initiators, and didn’t know it. Let that sink in: They’re charged with performing an evaluation, without knowing what they’re doing. The Cisco UCS VIC 1240 hardware CNA’s were utilized. Referring to them as software initiators caused some confusion. The Cisco VIC is a hardware initiator and we configured them with virtual HBAs. Evaluator Group has no knowledge of the internal architecture of the VIC or its driver. Our commentary of the possible cause for higher CPU utilization is our opinion and further analysis would be required to pinpoint the specific root cause. Of course, it wasn’t the software initiator. They didn’t use a software initiator, but they were so clueless, they didn’t know they’d actually used a hardware initiator. Without knowing how they performed their tests (since they didn’t publish their methodology) it’s purely speculation, but it looks like the problem was caused by congestion (from them architecting the UCS solution incorrectly). Reason #2: They’re Hilariously Bad At Math. They claimed FCoE required 50% more cables, based on the fact that there were 50% more cables in the FCoE solution than the FC solution. Which makes sense… except that the FC system had zero Ethernet. That’s right, in the HP/Fibre Channel solution, each blade had absolutely zero Ethernet connectivity. In the Cisco UCS solution, every blade had full Ethernet and Fibre Channel connectivity. None. Zilch. Why did they do that? Probably because had they included any network connectivity to the HP system, the cable count would have shifted to FCoE’s favor. Let me state this again, because it’s astonishingly stupid: They claimed FCoE (which included Ethernet and FC connectivity) required more cables without including any network connectivity for the HP/FC system. Also, they made some power/cooling claims, despite the fact that the UCS solution didn’t require a separate FC switch (it’s capable of being a full-fledged Fibre Channel switch by itself), though the HP solution would have required a separate pair of Ethernet switches (which wasn’t included). So yeah, their math is a bit off. Had they done things, you know, correctly, the power, cooling, and cable count would have flipped in favor of FCoE. 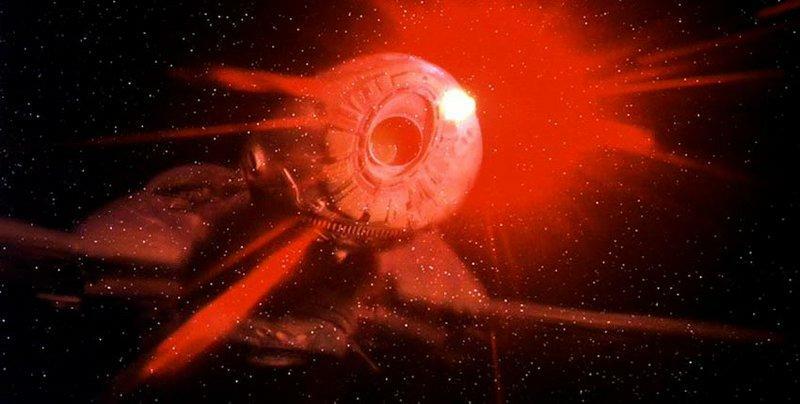 Reason #3: UCS is Hard, You Guys! They whinged about UCS being more difficult to setup. Anytime you’re dealing with unfamiliar technology, it’s natural that it’s going to be more difficult. 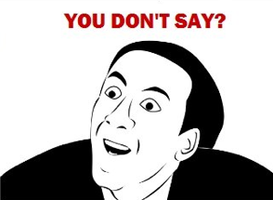 However, they claimed that they had zero experience with HP as well (seriously, who at Brocade hired these guys?) How easy is UCS? Here is a video done from Amsterdam where a couple of Cisco techs added a new chassis and blade and had it booted up and running ESXi in less than 30 minutes from in the box to booted. Cisco UCS is different than other blade systems, but it’s also very easy (and very quick) to stand up. And keep in mind, the video I linked was done in Amsterdam, so they were probably baked. For the past couple of years, VMware and NetApp have been doing performance tests on various storage protocols. Here’s one from a few years ago, which includes (native) 4 and 8 Gbit Fibre Channel, 10 Gbit FCoE, 10 Gbit iSCSI, and 10 Gbit NFS. The conclusion? The protocol doesn’t much matter. They all came out about the same when normalized for bandwidth. The big difference is in the storage backend. At least they published their methodology (I’m looking at you, Evaluator Group). Here’s one from Demartek that shows a mixture of storage protocols saturating 10 Gbit Ethernet. Again, the limitation is only the link speed itself, not the protocol. And again, again, Demartek published their methodology. Reason #5: How Did They Set Everything Up? Magic! Most of the time with these commissioned reports, the details of how it’s configured are given so that the results can be reproduced and audited. How did the Evaluator Group set up their environment? As far as I can tell, magic. There’s several things they could have easily gotten wrong with the UCS setup, and given their mistake about software/hardware initiators, quite likely. They didn’t even mention which storage vendor they used. So there you have it. A bit of a re-hash, but hey, it was a dumb report. The upside though is that it did provide me with some entertainment. My colleague Barry Gursky was playing with the new UCS Manager Emulator for the new 2.1 release (which you can find on Cisco’s web site, you’ll need a CCO account but no special contracts from what I can tell) and he noticed something. The Management IP Pool menu was missing. It’s normally in the Admin tab, as shown above. But sure enough, it was gone. You need pools of IP addresses to assign to service profiles and blades for out of band management (Cisco Integrated Management Controller, gives you KVM, IPMI, etc.). Or you could assign the IPs manually, but that would be rather annoying. Pools are way easier. We searched and finally found it moved to the LAN tab. The CCIE Data Center blueprint makes mention of NPV and NPIV, and Cisco UCS also makes heavy use of both topics, topics that many may be unfamiliar with most. This post (part of my CCIE Data Center prep series) will explain what they do, and how they’re different. NPIV and NPV are among the two most ill-named of acronyms I’ve come across in IT, especially since they sound very similar, yet do two fairly different things. NPIV is an industry-wide term and is short for N_Port ID Virtualization, and NPV is a Cisco-specific term, and is short for N_Port Virtualization. Huh? Yeah, not only do they sound similar, but the names give very little indication as to what they do. First, let’s talk about NPIV. To understand NPIV, we need to look at what happens in a traditional Fibre Channel environment. When a host plugs into a Fibre Channel switch, the host end is called an N_Port (Node Port), and the FC switch’s interface is called an F_Port (Fabric Port). The host has what’s known as a WWPN (World Wide Port Name, or pWWN), which is a 64-bit globally unique label very similar to a MAC address. However, when a Fibre Channel host sends a Fibre Channel frame, that WWPN is no where in the header. Instead, the host does a Fabric Login, and obtains an FCID (somewhat analagous to an IP addres). 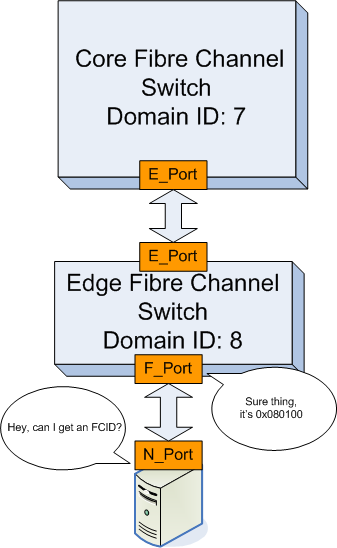 The FCID is a 24-bit number, and when FC frames are sent in Fibre Channel, the FCID is what goes into the source and destination fields of the header. Note that the first byte (08) of the FCID is the same domain ID as the FC switch that serviced the host’s FLOGI. In regular Fibre Channel operations, only one FCID is given per physical port. That’s it. It’s a 1 to 1 relationship. 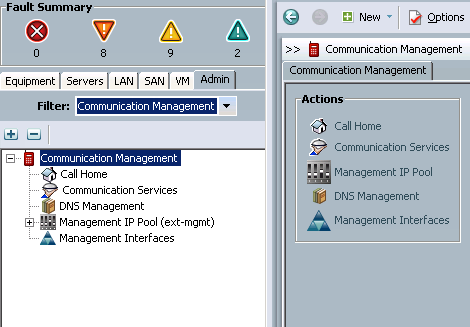 But what if you have an ESXi host, for example, with virtual fibre channel interfaces. 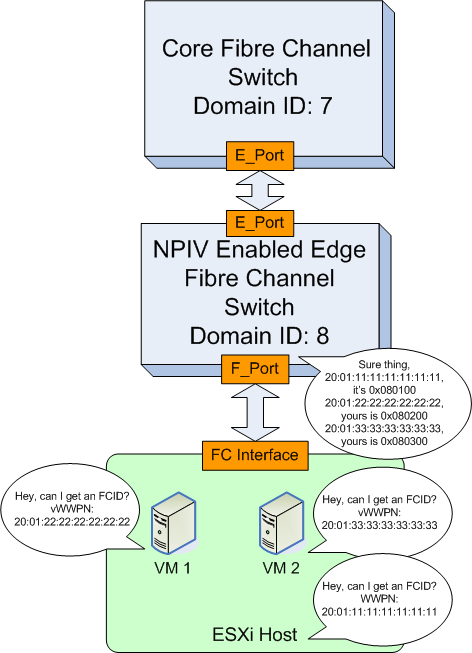 For those virtual fibre channel interfaces to complete a fabric login (FLOGI), they’ll need their own FCIDs. Or, what if you don’t want to have a Fibre Channel switch (such as an edge or blade FC switch) go full Fibre Channel switch? NPIV lets a FC switch give out multiple FCIDs on a single port. Simple as that. NPV is typically used on edge devices, such as a ToR Fibre Channel switch or a FC switch installed in a blade chassis/infrastruture. What does it do? I’m gonna lay some Star Trek on you. NPV is a clocking device for a Fibre Chanel switch. Wait, did you just compare Fibre Channel to a Sci-Fi technology? How is NPV like a cloaking device? Essentially, an NPV enabled FC switch is hidden from the Fibre Channel fabric. 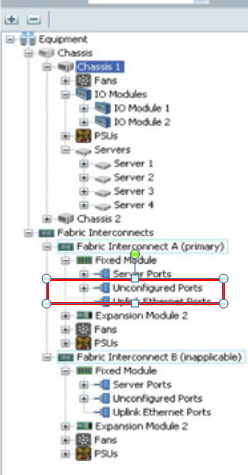 When a Fibre Channel switch joins a fabric, it’s assigned a Domain_ID, and participates in a number of fabric services. With this comes a bit of baggage, however. See, Fibre Channel isn’t just like Ethernet. A more accurate analogue to Fibre Channel would be Ethernet plus TCP/IP, plus DHCP, distributed 802.1X, etc. Lots of stuff is going on. And partly because of that, switches from various vendors tend not to get a long, at least without enabling some sort of Interopability Mode. 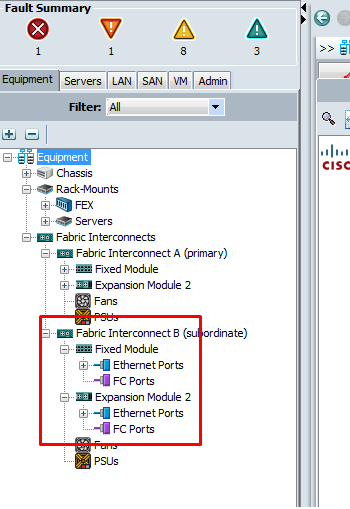 Without interopability mode, you can’t plug a Cisco MDS FC switch into say, a Brocade FC switch. And if you do use interopability mode and two different vendors in the same fabric, there are usually limitations imposed on both switches. Because of that, not many people build multi-vendor fabrics. Easy enough. But what if you have a Cisco UCS deployment, or some other blade system, and your Fibre Channel switches from Brocade? As much as your Cisco rep would love to sell you a brand new MDS-based fabric, there’s a much easier way. (Note: NPV is a Cisco-specific term, while other vendors have NPV functionality but call it something else, like Brocade’s Access Gateway.) 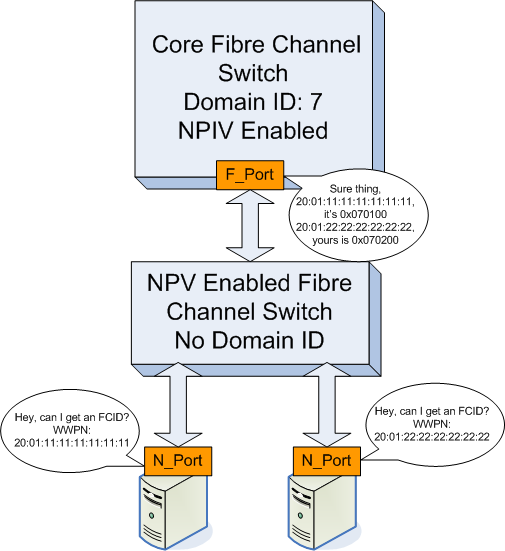 A switch in NPV mode is invisible to the Fibre Channel fabric. It doesn’t participate in fabric services, doesn’t get a domain ID, doesn’t do fabric logins or assign FCIDs. For all intents and purposes, it’s invisible to the fabric, i.e. cloaked. This simplifies deployments, saves on domain IDs, and lets you plug switches from one vendor into a switch of another vendor. Plug a Cisco UCS Fabric Interconnect into a Brocade FC switch? No problem. NPV. Got a Qlogic blade FC switch plugging into a Cisco MDS? No problem, run NPV on the Qlogic blade FC switch (and NPIV on the MDS). The hosts perform fabric logins just like they normally would, but the NPV/cloaked switch passes FLOGIs up to the NPIV enabled port on the upstream switch. The FCID of the devices bears the the Domain ID of the upstream switch (and appears directly attached to the upstream switch). The NPV enabled switch just proxies the FLOGIs up to the upstream switch. No fuss, no muss. Different vendors can interoperate, we save domain IDs, and it’s typically easier to administer. TL;DR: NPIV allows multiple FLOGIs (and multiple FCIDs issued) from a single port. NPV hides the FC switch from the fabric.